King Hill, West Malling will be closed from the 8th April for up to 12 days. The road will be closed between numbers 39 and 45. The alternative route is via A228 Ashton Way, A20 London Road, Town Hill/High Street/St Leonards Street and vice versa. CATCHING BREAST CANCER EARLY AND THE MENOPAUSE, AND WHERE HRT FITS IN EVENT Due to popular demand West Malling Group Practice are organising a third 'Catching Breast Cancer Early and The Menopause, and Where HRT Fits In' event. Should you be interested in attending, please email your intention to wmgpppg@gmail.com or complete and hand in an application form available at surgery receptions. The Patient Participation Group will be holding their Annual General Meeting on Wednesday 27th March at 7pm at the Kings Hill Surgery. All patients are entitled to attend. Look out for the Kings Hill Parish Council Annual Report being delivered to residents this week. Any questions you may have can be answered by attending the Annual Parish Meeting on Wednesday 3rd April 2019, 7pm, at the Kings Hill Community Centre. 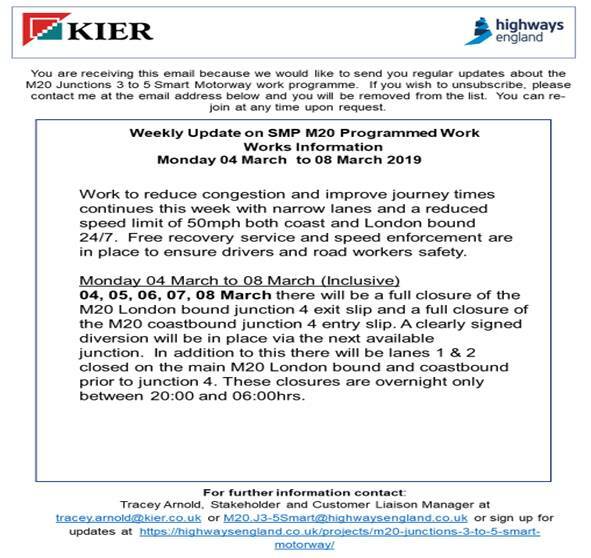 Saturday 30th March - Sunday 31st March 10pm to 6am London-bound full overnight closure. Sunday 31st March - Monday 1st April 10.30pm to 5.30am London-bound full overnight closure. Everyone is welcome to the KHPC full council meeting Wednesday 13th March at 7.30pm, when we will have the TMBC waste team in attendance, who will be explaining all you need to know about the new waste and recycling collection. Fortune Way will be closed from 13th March 2019 for up to 1 day between the junctions of Anisa Close and Richmond Avenue. The alternative route is via Tower View, Winston Avenue, Discovery Drive and vice versa. This is to enable ironwork repairs to be carried out by KCC. If you live in Kings Hill or surrounding villages, and have a son or daughter who goes to school in Tonbridge, then you might be interested in getting a direct bus service to speed the journey up. You still have time to fill in the survey, and register your interest, so please fill this in if you have a son or daughter who would use the service, and share with any other parents who might be interested. KCC has informed us that it will be necessary to close Fortune Way, Kings Hill from 28 January 2019 for up to 1 day. The road will be closed between the junctions of Anisa Close and Richmond Avenue.The alternative route is via Tower View, Winston Avenue, Discovery Drive and vice versa. This is to enable ironwork repairs to be carried out by KCC.